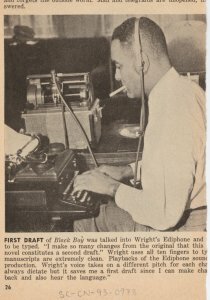 "Author Richard Wright sitting at typewriter and listening through an Ediphone to create a draft of his autobiography Black Boy." Source: Schomburg Center for Research in Black Culture, Photographs and Prints Division. New York Public Library. June 4, 1945, page 87-93. Photographs used to illustrate 12 Million Black Voices published in 1941, text by Richard Wright and photo direction by Edwin Rosskam. Biographical essay from Encyclopedia of World Biography.